Professor Abdus Salam, Nobel Laureate in Physics (1979), has been one of the greatest exponents in physics the last century. Professor Salam is famous for that electroweak theory which is the mathematical and conceptual synthesis of the electromagnetic and weak interactions - the latest stage reached until now on the path towards the unification of the four fundamental forces of nature. He was the main force behind setting up of the International Centre for Theoretical Physics (ICTP), Trieste, Italy, which provided a way for scientists in the third world countries to continue working for their own communities while still having opportunities to remain first-rate scientists. The Abdus Salam Memorial Lecture, started by the Department of Physics, Jamia Millia Islamia, New Delhi, tries to perpetuate the ideas that Salam believed in; namely the need for developing countries to encourage education and research in the fundamantal sciences. 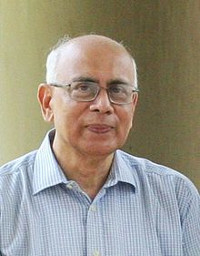 An eminent person of science is invited each year to deliver this lecture. The style and content of the lectures is such as to inspire and to convey the excitement of new discoveries, ideas and challenges. "Hidden Symmetry in Planetary Motion"
Jamia Millia Islamia, New Delhi-110025.